While sailing (being a sport I can’t remember starting) was — and still is (?) — my first love, the Scottish mountains have also played a major part in my life for many years. 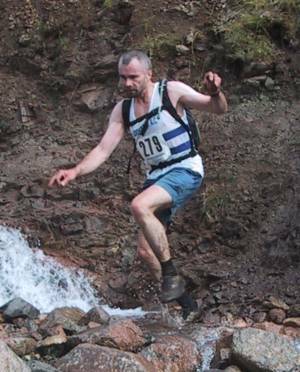 So perhaps I don’t climb as much as I used to these days didn’t climb so much in my thirties, but my fortieth birthday in November 2003 proved to be the catalyst for a return to the Lochaber hills and a new lease of life as a hill runner. While I was neither a bold nor a particularly technical climber by the standards of my contemporaries, I climbed regularly to VS/HVS throughout my late twenties and was certainly quite fit in those days. But returning to sailing and buying my own boat for the first time led to my climbing activities becoming more infrequent and me becoming lazier, heavier and less fit! So of course I always meant to do something about that, but never really did till I saw 40 looming and more-or-less decided it was ‘now or never’. At which point, about a fortnight before my birthday and almost overnight, I started watching what I eat, leaving the car at home and walking whenever I didn’t absolutely need the wheels. Still not convinced that merely walking was doing me enough good, however, I soon found myself both running and enjoying it. So it might have taken me years to make myself do something but, as far as I’m concerned, there’s absolutely no mystery to losing weight and getting fit. It’s a simple case of ‘eat less, do more’ (the one true diet! ), which is pretty well infallible so long as you stick to the rules. So I dropped two stone (about 12.7kg) in weight over the first two months and another over the next two or three, taking my BMI from a fairly chunky 28.7 to a much more compact 22.9 (so I might be built like a brick but at least I’ve become a fit brick! ), and have managed to keep myself mostly in the lightest, fittest shape (BMI 21.9 at 1 July 2006) of my adult life ever since. While I can’t remember exactly when I laced up my old Walsh PBs instead of my boots for the first time in years and started to run instead of walk, the moment that now seems to define this fresh start came on Saturday 20 December 2003 (the day after school broke up for the Christmas holidays), when I ran/jogged/bumbled (to quote my own words at the time) from my garden gate to a snowy Blackwater Dam and back by the Ciaran Path in under two hours for the first time. By late February 2004, despite still being ‘too soft to run all the way’, I’d broken an hour-and-three-quarters for this very rough circuit of 9.1 miles and 450m ascent, and subsequently broke an hour-and-a-half (running all the way!) for the first time in late June. By this time I’d also twice done a double trip to the Dam and back (once to raise funds for our school Paris trip and once in training for that), set myself and achieved a series of ever faster targets on a couple of shorter training routes (the Penstock and Loch Eilde Mor being my other favourite destinations for these early runs), worn out another pair of running shoes and, much to my own surprise (but expedited by my decision to keep the boat ashore for a season), joined Lochaber Athletic Club, entered for the 2004 Ben Nevis Race and targeted the infamous ‘Triple Hirple’ (three shorter races in three days) for some preparatory competition. So I had high hopes at this stage of breaking the two hour barrier for my first Ben Race, but then things started (almost literally) to go slightly pear-shaped when I developed a double hernia for no apparent reason at all in July! Still recovering from the operation when this page was first added to my site (8 October 2004), it was very satisfying to see my best times at age 40 for my standard training runs start tumbling again at ages 41 and 42 with my return to full fitness. For sure (being neither built like a whippet nor the right side of 40) I was never going to be a top class competitive runner, but travelling light and moving quickly on the hills is still immensely rewarding for its own sake, and (notwithstanding some decent performances in hill/trail races including a number of big ultras) quite simply what I prefer to be doing now I’ve reached my not-so-speedy 50s. See this page (new, May 2016) for a range of trail routes from 5.4 km (3.4 miles) to 10.3 km (6.4 miles).